It’s cold. Beautifully sunny outside, but cold. When I’m this cold all I can think about is my next cuppa. And therein lies the danger – one cuppa after another and my caffeine intake soon spirals out of control. Next thing I’m jumpy, irritable (I know, few would believe it…) and all a bit of a jitter. It’s just too easy to reach for the same old brew each time (Earl Grey is my current favourite) but with a little imagination it’s possible to create something really tasty that actually does physiologically help to warm us up but helps keep our (distinctly decaffeinated) cool. The smell of Cinnamon is very much associated with the Festive Season. It not only smells nice but is a really gentle, warming herb particularly good for people who need a bit of extra help digesting food in the winter because their digestive fire is low. Cinnamon is also extremely good at balancing blood sugar and research has looked into the possibility of using it in early Type II Diabetes. I also find it helpful for patients who tend to get low blood sugar episodes. 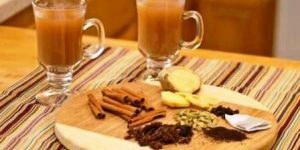 But my absolute favourite frost-buster, is a steaming hot cup of traditional Indian Masala Chai with aromas of Cardamom, Ginger, Allspice, Star Anise and Cloves – each of them warming and rich. For those of you avoiding milk, swap your cow juice for bean juice and try a soya version instead. If you are concerned about your sugar intake, then reduce the sugar in traditional recipes which tend to be very sweet. How you like your Masala Chai is a bit like how you like your eggs in the morning – it’s a very personal thing. Happily there are a plethora of recipes out there and some half-decent preblended mixes too.